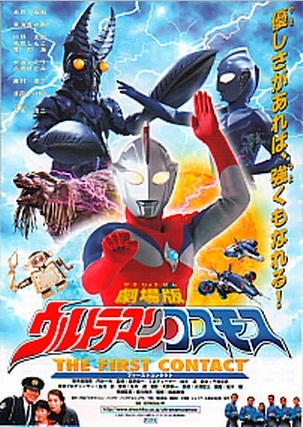 In space, Ultraman Cosmos is at the battle with Baltan to stop him to invade Earth. A young boy named Musashi (Kounosuke Tokai) who is a 5th grader who has a lot of dreams, such as becoming astronaut to sail the sea of stars, and meet Ultraman. One night he comes to the forest park to observe eclipse with his friends. Unfortunately it rains, so everybody go home except Musashi. Meanwhile, in the rain, Ultraman Cosmos is at the battle with Baltan to stop him to invade the cities. They both use their powers to clash each other. After the explosion, they fall in different directions. Later Musashi went to see what happen in the forest. Ultraman Cosmos comes in front of Musashi, lost lots of energy during the battle. Ultraman Cosmos regained the power with the help of Musashi. Before Cosmos leaves Earth, he gives a mysterious blue bright stone to Musashi. Later on Earth, Baltan awakens a monster called Don Ron from hibernation. At the next morning Team EYES leads with the other croud to put Baltan to sleep, but the situation only gets worse when SHARKS shoots Baltan and woke him up. Angry, Baltan unleashes an assault to SHARKS and the Earth and proclaims he never trust to the Humans and lead forward to his invasion.